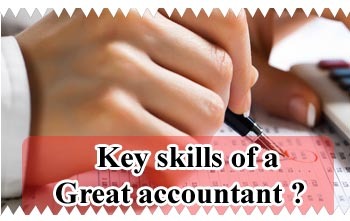 Accountants should possess certain characteristics that will allow them to do their jobs well. Recruiters are seeking Accountants who are able to grasp new concepts quickly whether it is understanding new information or data, managing a project, or meeting a new client. Your intellectual skills will not be judged by your academic grades only, you need to show them how your knowledge value in a practical situation. - Knowledge about latest accounting rules and theories. - Having a solid grasp of your client’s business requirements and goals. - Team Player. You should have the ability to work with different types of personalities. - Analytical and interpretational skills..
- Management and Leadership skills. - Technical Skills. Computer and office skills. Sample answers: I believe that a good accountant must have sound maths and numeracy skills even though most of the work is performed by systems and spreadsheets! Similarly, accountants are able to rely on IT systems, to present the information. Not only does this make tasks more efficient, it enables accounts to generate highly accurate and insightful information. This means it is very important for modern accountants to have well developed computer skills. Apart from this, Accountant aslo needs to have good analytical and interpretational skill to prove them they work best.